Meet a crane operator and find out about cranes that are as tall as a 20-story building and can lift loads as heavy as 150 elephants. See how a suitcase with wheels is made. Find out how to lift something heavier than yourself! An A to Z guide to everyday inventions. An amazing flap book packed with inventions, machines, gadgets and devices, and facts and information about how they work. Over 90 flaps reveal the insides of car engines, toilets, escalators, submarines and microwaves and many, many other machines. Includes internet links to websites with animations, games and experiments. 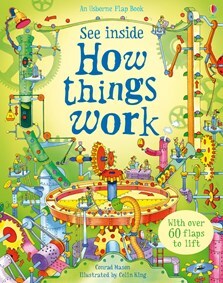 These days youngsters don't want to just hear about the mechanics of life, they want to see for themselves exactly what makes our world tick...So Usborne have come up with the perfect answer ... a beautifully designed and illustrated book with over 90 flaps to lift and make exciting discoveries. How Things Work is literally a hands-on science lesson! From simple machines (cogs, pulleys, levers) to planes, vehicles and microwaves, How things work reveals the science behind how things work and offers 90 flaps to lift and fantastic, detailed illustrations. A big bright book with robust pages. Familiar objects, from domestic to industrial, are described on every page and then you lift the flap to find out how they work. So, look inside the piano to see the hammer action, lift the flap on the loo to see how ballcocks work. Check out zips and ballpoint pens. Large machines, like excavators, have more than one flap and a lot of information is packed into small spaces. A book to talk about and maybe follow up on the related website. This is a thoroughly modern information book: highly visual, interactive and linked to websites. In each example the main picture shows the external structure and you lift the flap for an explanation of how the machine works. The copious yet clear annotation shows young readers the importance of the verbal as well as the visual in texts that explain...deserves a place on the Primary school science shelf. My 5 year old curious daughter loves this book. Simple language but with key vocabulary. Loads of opportunity for discussion and exploration. This is a favourite for bed time reading and long car journeys as there's so much in it. Highly recommend for an child curious about the world.